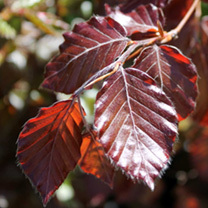 Purple or Copper Beech is a really classy hedging plant - luxurious green/black/purple leaves from spring until late autumn and then (like green Beech) it's leaves turn copper brown so it has two completely different appearances each year bringing great variety to the garden. Grows 30-60cm per year. Available in packs of 10 or 20 potted plants, supplied in 2 litre, 3 litre or 5 litre pots.